Brigadier General Richard M. Baughn entered the Army Air Force aviation cadet training program in January 1943 and received his pilot wings and commission as second lieutenant in April 1944 and retired from the US Air Force in July 1975. Baughn was born in Council Bluffs, Iowa in 1923, graduated from Abraham Lincoln High School and received a BS from theUniversity of Maryland. His military schools include the USAF Air Tactical School, the ArmedForces Staff College and Great Britain’s senior military school, The Imperial Defence College. He is a command pilot with more than 7,600 flying hours, including more than 5,000 in jet fighter aircraft. General Baughn has flown the P-40; P-51; P-47; F-80; RF-80; T-33; F-84B, F, and G; F-86E,F and H; F-100C,D and F; F-104A, C and D; F-105D and F; F-4C,D and E; A-6; F-111A and E; FB-111; KC-135; Meteor; Hawker Hunter, Lightning and 14 other types of military aircraft. He flew combat in P-51’s with the 8th AF during WWII and in 1965-66 he flew three temporary F-105 combat tours, one at Tahkli and two at Korat, Thailand, before completing a full F-105 combat tour in 1966, as the commander of the 13th TFS. In addition to a full complement of F-105 fighters, the 13th TFS was also assigned all of Korat’s F-100 and F-105 Wild Weasels and about half of Baughn’s missions were flown with them. In June 1974 General Baughn was appointed deputy defense attaché, Defense Attaché Office, Saigon, Republic of Vietnam, his last assignment prior to his retirement. His decorations include the Silver Star, Legion of Merit, three Distinguished Flying Crosses, Bronze Star Medal, 15 Air Medals and two Air Force Commendation Medals. His book “The Hellish Vortex: Between Breakfast and Dinner,” a carefully researched historical novel about a WWII P-51 pilot in the 8th AF, won a 2008 Eric Hoffer Notable Award for fiction and a 2008 honorable mention award for fiction from The Writer’s Digest. The Hellish Vortex is available at Amazon.com in both paperback and electronically in Kindle. 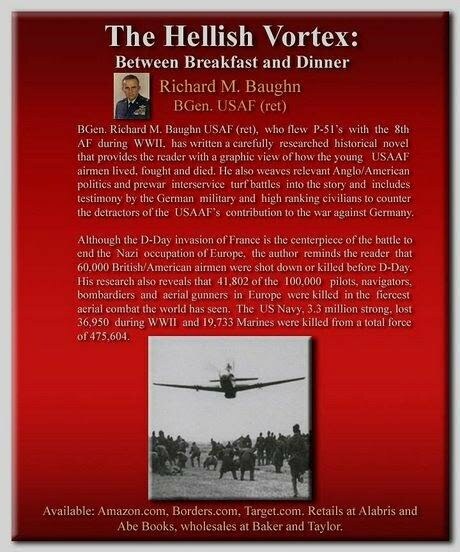 BGen Richard M. Baughn USAF (ret), who flew P-51’s with the 8th AF during WWII, has written a carefully researched historical novel that provides the reader with a graphic view of how the young USAAF airmen lived, fought and died. He also weaves relevant Anglo/American politics and American prewar interservice turf battles into the story and includes testimony by the German military and high ranking civilians to counter the detractors of the USAAF’s contribution to the war against Germany. Although the D-Day invasion of France is the centerpiece of the battle to end the Nazi occupation of Europe, the author reminds the reader that 60,000 British/American airmen were shot down or killed before D-Day. His research also reveals that 41,802 of the approximate 100,000 US Army Air Force pilots, navigators, bombardiers and aerial gunners assigned in Europe were killed in the fiercest aerial combat the world has seen. Available on Amazon, read for free on Amazon Kindle Unlimited.